We are only allowed to eat one variety of pumpkin in our house – butternut pumpkin.Why?Well, before I met my husband he wouldn’t eat any pumpkin (in addition to a number of other blacklisted fruits and veges). But in the words of Marge Simpson “He’s a changed man Lisa, he’s a changed man.” I’m not sure how I did it but now I have converted him to eating pumpkin, actually I need to be more specific, I have converted him to eating butternut pumpkin. Whenever we sit down to a dinner with pumpkin in it he is a like a little Spaniel sniffer dog smelling and inspecting his meal to make sure his pumpkin is legal. To be honest, it really doesn’t bother me too much. It is better to have him eating one type of pumpkin than none at all, especially because it is in season right now. 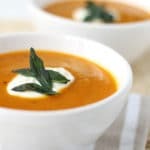 I think the best way to eat pumpkin is roasted, it takes on a caramel like sweetness, and in a soup. Even the skin is delicious and caramelised when roasted. So to make the soup even easier, I just put the whole pumpkin, skin and all (minus the seeds), into the blender! It still makes a delicious velvety soup, but if you prefer, scoop out the flesh and discard the skins. If you’re feeling particularly fancy you can also push the soup through a sieve before serving, this makes it even more velvety, but I’m usually too busy (read: lazy) for that. 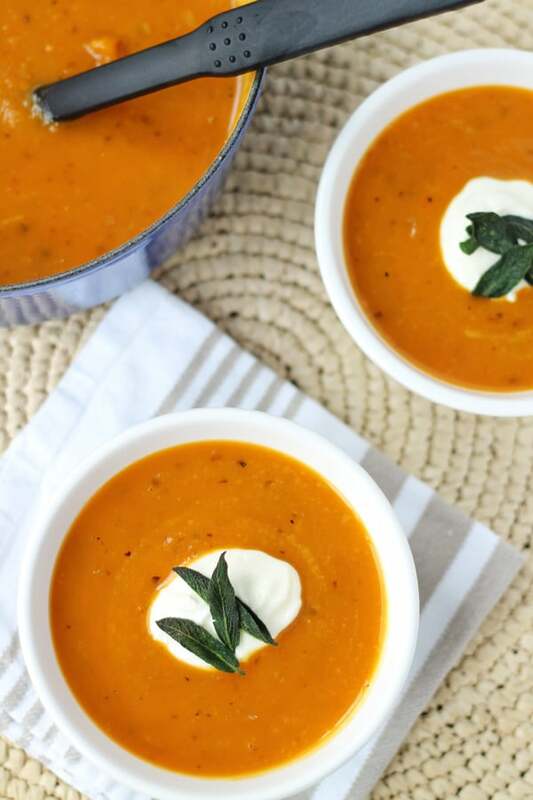 If you’re looking for another excuse to make this soup, then it’s cost. I got my pumpkin for $2 at the supermarket and if you make your own stock the soup is a quick and easy meal for four that costs next to nothing. Don’t have time to make your own stock? I hear you! Just buy it. There are some great stocks on the market out there but you would be surprised how easy it is to make your own. I’ll show you all how in a later post. If your husband isn’t a pumpkin snob like mine then you can make your meal for even less. This recipe works with any pumpkin (e.g. crown, buttercup squash or blue) and most of these are cheaper than butternut pumpkin, I have seen buttercup squash for as little as 10c each! Lastly, please don’t buy the sage from the supermarket, you get a tiny little packet of limp herbs in exchange for a gold bullion. Sage is such a hardy herb and is so easy to grow whether it is in your garden or in a pot, so why not plant one today. If you don’t have any in your garden ask a friend or get it from a market. I got a bunch of sage for free at my local farmer’s market (in the centre of Auckland no less). Or as a last resort, use another herb (rosemary, thyme or oregano also taste wonderful) or just leave it out all together. Add a dollop of yoghurt and a piece of crusty bread and voila dinner is served! Preheat oven to 200C (390F). Cut the pumpkin in half length ways, then each half into thirds, scoop out seeds and cut off the stalks. Either discard the seeds or reserve for roasting at a later point. Place pumpkin and onion halves, both skin side down, on baking tray, drizzle with 1 Tbsp of olive oil and season. Bake for 35 min until pumpkin is soft. Remove vegetables from oven and allow to cool. 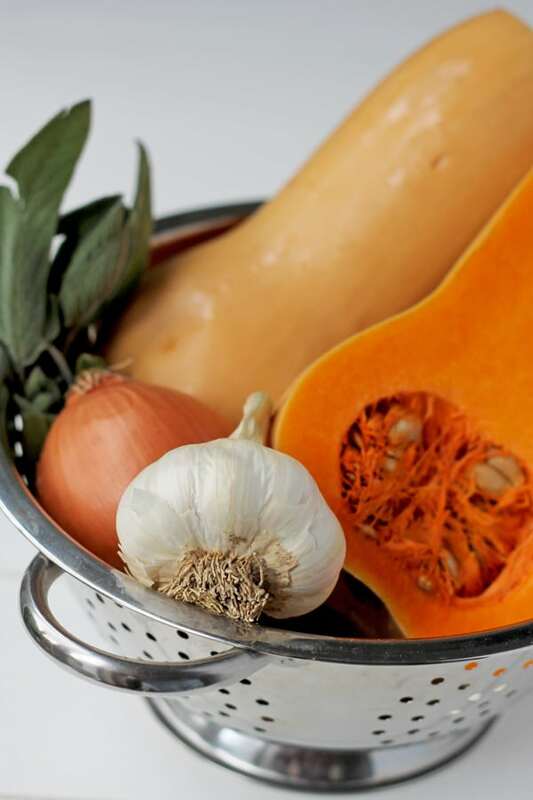 Once cool enough to handle, discard the onion skins and place onion and pumpkin into a food processor, blender or using a stick blender, with 1 cup of stock, blend until smooth. If using butternut pumpkin feel free to leave the skins on, they are delicious and soft once roasted. However, if you are using a pumpkin with a tougher skin (e.g. crown/grey pumpkin, buttercup squash or any blue pumpkin) you may want to scoop out the flesh and discard the skins once cooked. In a large saucepan on medium heat add 1 1/2 Tbsp olive oil. Add the sage leaves and fry for approximately 30 sec or until crisp. Remove with a slotted spoon and place on a paper towel. Add the garlic and red pepper flakes to the saucepan for 1 minute then the pumpkin mixture and remaining stock. Once the soup is heated through, check the seasoning and remove from heat. Divide among your bowls and top each portion with a dollop of yoghurt and 3 crispy sage leaves. Feel free to add more stock as required to achieve your desired soup consistency. 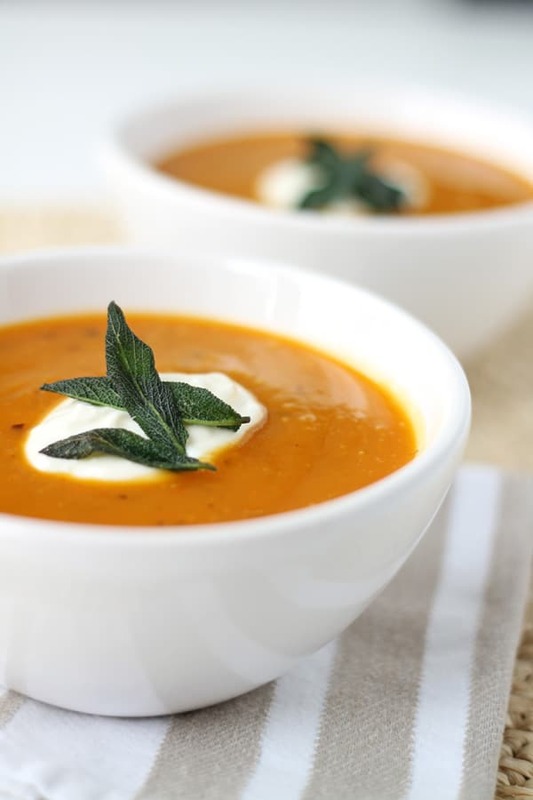 If you want an extra velvety soup, pass the soup through a sieve prior to serving. Kate. You have been so busy. I look forward to you Friday night drinks and ideas.